The Legend of Zelda is one of the most successful franchises of all time with nearly twenty video games and thirty years of history, but it all started with a gold cartridge . . . The cover is a gold foil paper with gloss lamination and a spot gritty varnish. The details are embossed and debossed. It has gold gilding on the top and foredge, with black gilding on the bottom. This book looks and feels so much like the original cartridge you might find yourself blowing into the bottom before you open it! A comprehensive collection of enemies and items, potions to poes, an expansion of the lore touched upon in Hyrule Historia, concept art, screencaps, maps, main characters and how they relate, languages, and much, much more, including an exclusive interview with Series Producer, Eiji Aonuma! 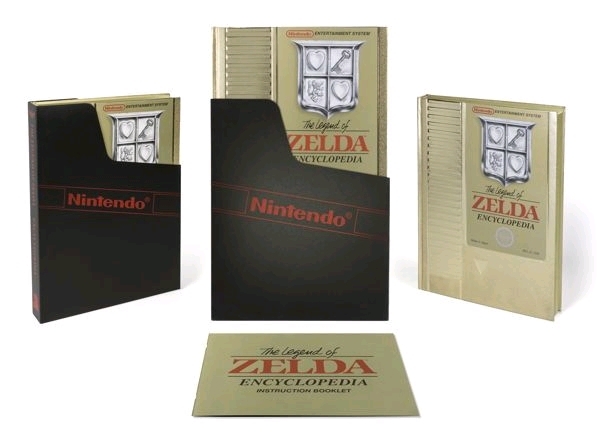 This, the last of The Goddess Collection trilogy, which includes Hyrule Historia and Art & Artifacts, is a treasure trove of explanations and information about every aspect of The Legend of Zelda universe! Celebrate over thirty years of The Legend of Zelda with a heartfelt homage to the origins of this legendary franchise!